How to Cook Baked Potato is a skill that anyone can master in the kitchen. Everyone should know HOW TO COOK a PERFECT BAKED POTATO! These baked potatoes turn out tender, flavorful, and perfect every single time. We will show you how to bake a potato and all of our favorite toppings. 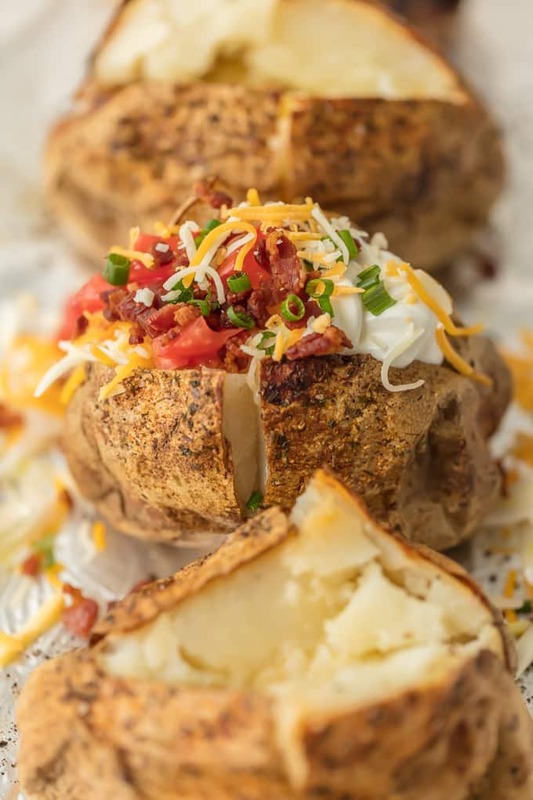 A simple Baked Potato is the ultimate easy side dish recipe! Once you know How to Cook a Baked Potato that’s crispy on the outside and soft on the inside, all is right in the world. A simple Baked Potato is the ultimate EASY side dish recipe. You might think knowing how to cook baked potatoes is common sense, but to me, it simply wasn’t! 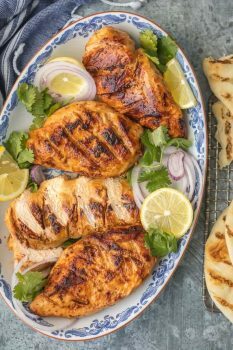 When I didn’t know how to cook before I started this site, the easy stuff is what scared me the most. The things that I felt like I should just instinctually know how to do were the most intimidating because I felt asking would be embarrassing. So I just didn’t try. I want The Cookie Rookie to be a resource to you in all types of recipes, even the VERY SIMPLE ones (especially those!) so I am going to start to document more recipes like this one, HOW TO BAKE A POTATO! 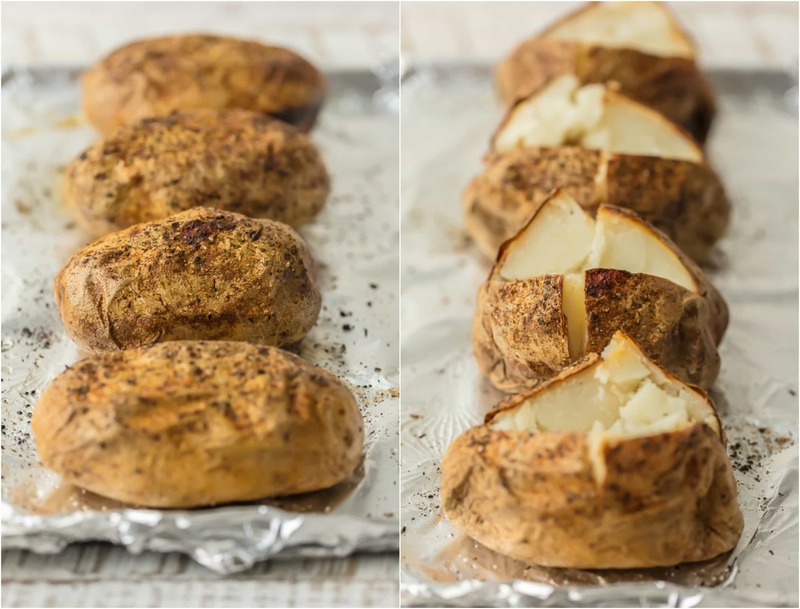 And more than that, I want to show you how to cook the PERFECT Baked Potato! These little tips and tricks to make your potatoes crispy and salty on the outside and tender/delicious on the inside make all the difference in making the perfect potatoes. 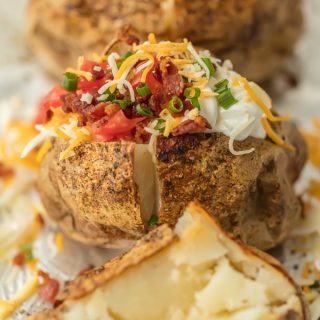 There’s nothing better than a simple ole baked potato side dish for meals such as steak, chicken, and everything in between. What do you put on a Baked Potato? How do you like your baked potatoes? I like mine loaded with ALL THE FIXINGS. I’m known for loading mine up with everything good in this world…cheese, sour cream, bacon, tomatoes, onion, and more. We have listed all of our go-to garnishes in the recipe card below. 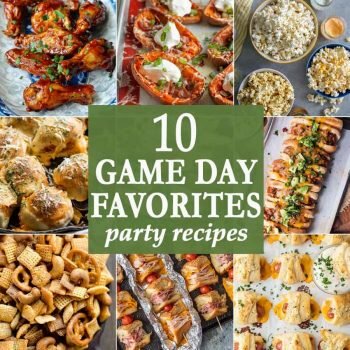 Get creative…I’ve seen everything added on from Philly Cheesesteak to Buffalo Chicken! Is a Baked Potato good for you? YES! Baked Potatoes are high in magnesium and potassium which are both great for heart health. They also contain about 28% of your daily fiber needed. AWESOME! I know I negate some of the positives by loaded them with all those toppings…but at least the nutrients are hiding underneath. All those years I went not knowing how to bake a potato…I was missing out! 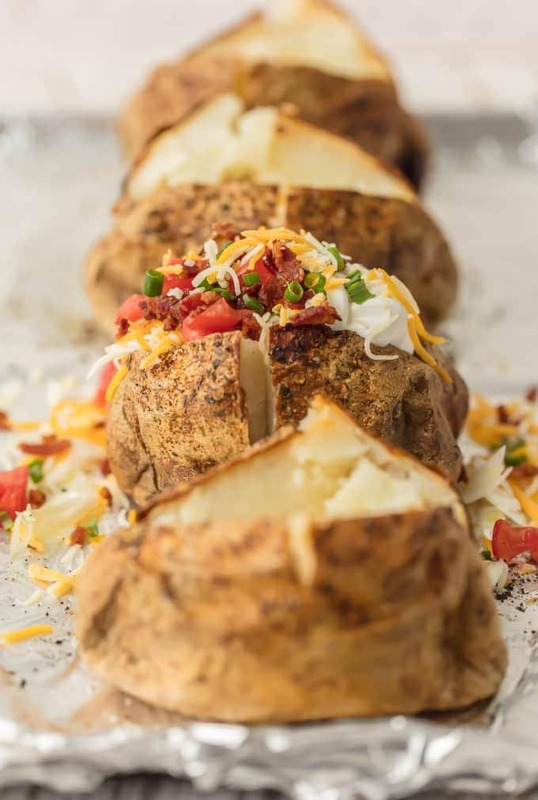 What are your favorite dishes to serve with these Baked Potatoes? 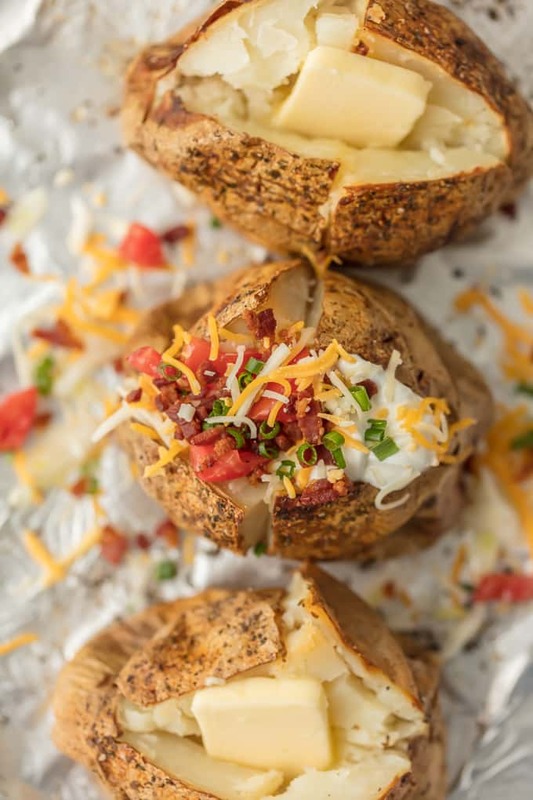 I love this Baked Potato recipe with everything, but I’m partial to serving it with Baked Fried Chicken, Basil Chicken, Caesar Chicken, Stovetop Burgers, and French Dip Sandwiches! There’s always room at our table for a perfect baked potato. If you’ve been cooking for years or just starting out, never be embarrassed to brush up on the classics. We love HOW TO recipes around here. 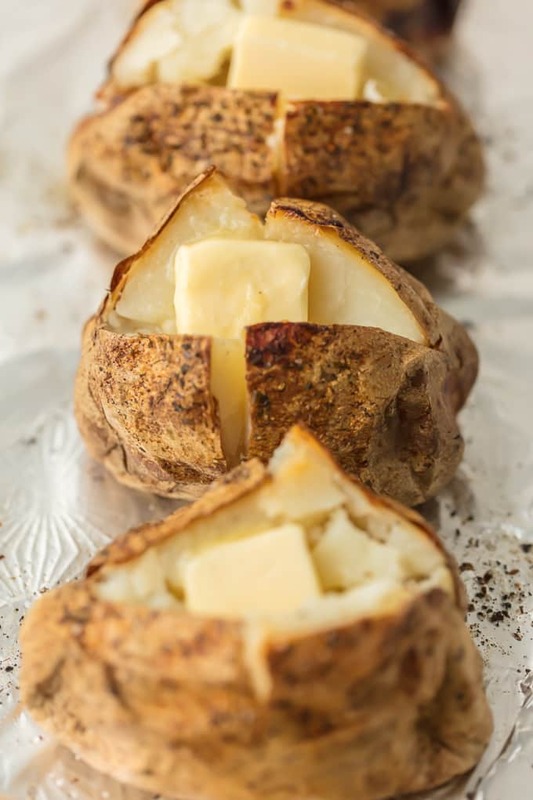 These ideas for how to bake a potato are great for anyone to remember! (The tips in our HOW TO COOK CORN ON THE COB are my LIFE!). See the recipe card below for full details on How to Cook a Baked Potato and make it perfect! Enjoy. Cover a rimmed baking sheet with foil and set a wire rack inside. Place oven rack in the middle of the oven and heat oven to 450F. Dissolve salt in warm water, then place the potatoes in the water. Be sure the entire potato is moistened. Transfer potatoes to the prepared baking sheet and bake at 450F, 45-60 minutes. If using a food thermometer, the center of the largest potato should register 205F. Remove potatoes from the oven and leave the oven on at 450F. Brush the tops and sides of the potatoes with oil, and sprinkle them with the seasonings (or at least salt and pepper). Place the potatoes back in the oven and bake another 10 minutes. Transfer potatoes to a serving plate/dish. Immediately after removing the potatoes from the oven (to release steam) use a sharp paring knife to cut a large X into the top of each potato. Use paper towels to hold both ends of the potato and push the potato together. Push firmly (but not too hard), and squeeze the potatoes (slightly harder from the lower sides of the ends of each potato). The flesh will push slightly up and out. Top the potatoes with your favorite baked potato toppings and serve. Those are some good looking potatoes. Reminded me of my time in England and their classic jacket potatoes. These however seem as an improved version which makes me hungry just by looking at your photos. I know what we’ll have for dinner tonight. :) Thank you Becky. Made them for dinner tonight. It was Perfect! Thank you for the tutorial, I appreciate it! What about poking holes in the potato so it doesn’t burst in the oven? I have had that happen and it’s a mess, lol. I really like your method of baking first, and then adding oil and seasoning before putting them back in. I’ll definitely be trying this! It really makes them PERFECT!